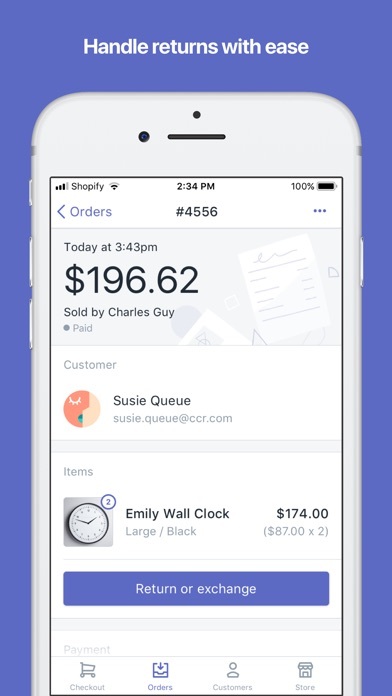 Easily sell your products and accept payments at markets, pop up shops, in-store, and anywhere else right from your iPhone or iPad. Use it with any Shopify plan. 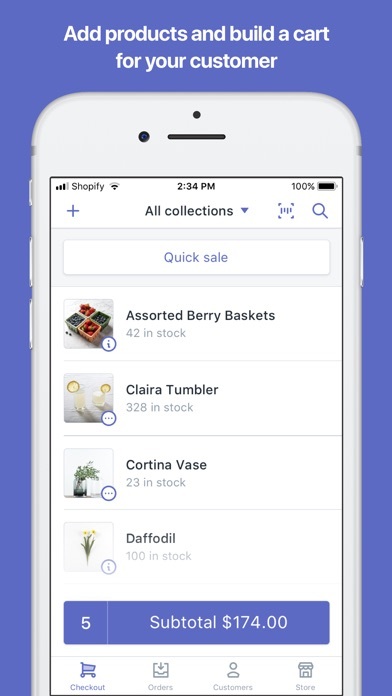 No matter where the sale takes place, your orders, inventory, and customers are automatically updated on your Shopify store. 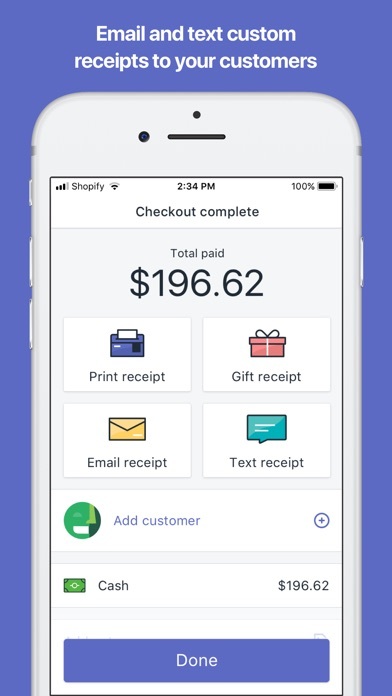 WHY CHOOSE SHOPIFY POS: • Start selling as soon as you download the app • Securely accept cash, credit, and debit • Attract more business by offering discounts • Email receipts directly to your customer • Sync products with your online store and other sales channels • Create new products and add product photos right from your camera or gallery • Set up sales taxes based on location automatically • Issue refunds on the spot • Accept customized purchases without affecting your existing inventory KEEP PAYMENTS SIMPLE • Accept cash, credit, and debit cards no matter where you are in the US. 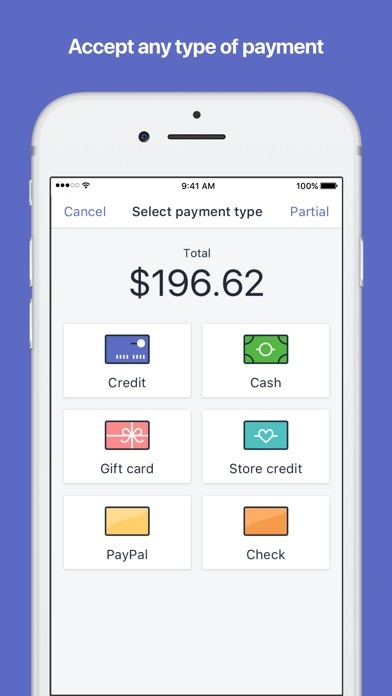 Our free card reader can be used with Shopify Payment • Securely accept EMV chip cards with our free chip & swipe reader • Accept EMV chip cards, and Apple Pay with our tap, chip, or swipe card reader • Process all credit cards at the same rate, with no hidden fees, for as low as 2.4% + 0¢ with Shopify Payments STAY ORGANIZED • View your online and physical store inventory all in one place • Get a warning when products are out of stock so you can plan ahead • Track customer orders • Add customized notes and attach customer details to orders WANT MORE? 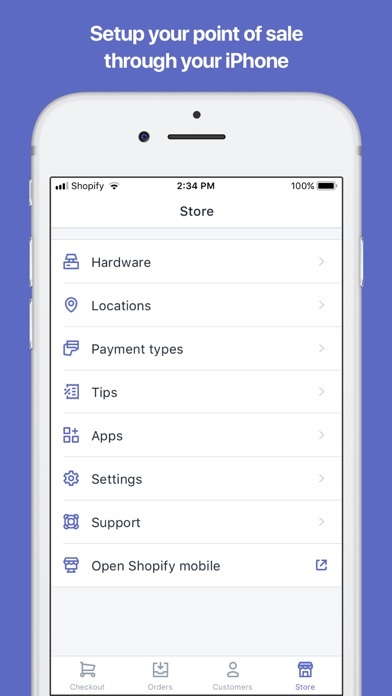 UPGRADE TO THE RETAIL PACKAGE TO: Integrate with the best retail hardware (available from the Shopify Hardware Store). Access third-party payment gateways to accept credit cards anywhere in the world. YOU GET EVEN MORE WITH THE IPAD VERSION: • Sell and accept physical gift cards • Track your cash float and summarize daily totals by enabling register shifts • Increase the security of your store by setting permissions and individual staff PINs • Save carts in case your customer wants to complete their transaction at a later date LOG INTO SHOPIFY.COM TO: • Sell online, in person, and on your favorite social channels in minutes • Manage your orders, products, and customers in one place • View sales, reports, and analytics about your business • Choose from hundreds of apps to help with marketing, shipping, accounting, and more QUESTIONS? Call us at 1-888-678-9481 for 24/7 support. You can also contact us at Shopify Support, or visit the Shopify Help Center. I need this for a sale tomorrow!! And it's not working after I installed the update! Please fix this today and push another update immediately. It’s stuck on the switching location screen on iPad and iPhone. What is wrong with the app? It stays on the switching locations screen and I can’t ring up a sale on my iPad or android phone! Fix this, please! It used to be so reliable! Most recent update automatically tries to send me to my shop location, but nothing loads and it just sits pending. Very unprofessional. Not clear on terms and conditions on what you can use the card reader for. Cooperate issue not a customer service issue. A way to search by typing in sku? I keep thinking there has to be a way. Because it seems an easily searchable filter and needed by a lot of us. A huge problem we have at our store is that once an item is scanned the keyboard disappears. It’s really frustrating when ringing up a customer and you can’t even search for your product. Please fix this! I don’t know what is going on but this does not take credit cards. I have done all of the necessary steps and have followed instructions on setting it up and have it connected and no matter what, it declines all credit cards. Price change when checking someone out. Add the ability to change a products price right in the cart or checkout page. Sometimes we need to change the price on the fly or we have items like a maintenance charge that changes for each customer. Lots of bugs on iPhone and iPad. Hoping new update fixes them. Thanks for you're hard work but please fix so we don't have to switch back to square this is so much better!! This app overall is good. But, it will not allow the option of making an online order/ship to customer. That’s something that is not on iPhone and it will be great. Being able to process the full transaction, process payments and have the merchandise shipped to the customer’s address. Please bring that option!! !